Article about how users do not read websites. You designed a beautiful web page. The color schemes and typography are perfect, the assets are beautiful, and the call-to-actions are intuitively positioned. Given all these things, you can count on users to interact with your page exactly as you intended, right? According to a study from the Nielsen Norman Group, the average page visit lasts less than a minute, leaving users the ability to read about a quarter of the text on the pages they visit. As a designer, you must acknowledge that users will not be on your page for long, and during the time they are on your page, they are not likely to read it carefully. Users will scan the page to find exactly what they’re looking for, as quickly as possible, but there are techniques you can employ to use this to your advantage. We should understand why users don’t read web pages. The Internet is a very distracting place, and users are pulled in many directions by web pages that want their attention. Users often surf the Internet in between doing other things, which leaves them limited time to pay attention to the content. With billions of options and limited time, we can’t expect to hold a user’s attention for long. Users are usually looking for specific information and will continue to surf until they find it in the most accessible way possible. Sometimes you can grab their attention with visual appeal. Items that are visually appealing also grab the user’s attention. 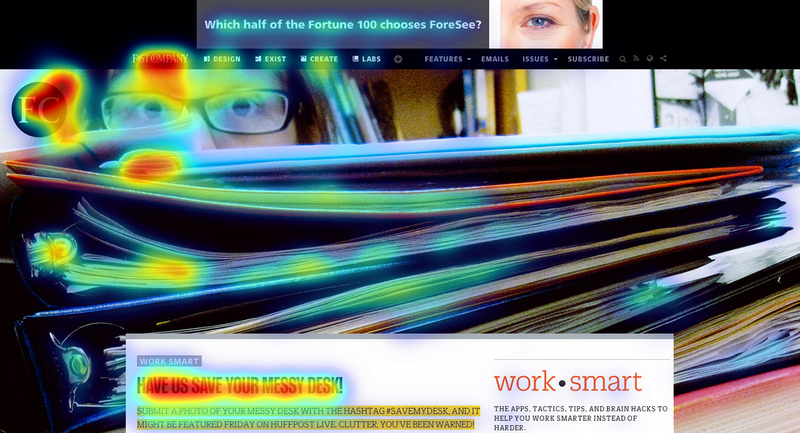 Checkout this example below, from a Fast Company article called “Eye Tracking And The Neuroscience Of Good Web Design”. As you can see, the red is where the users paid the most attention. In this case, the users focused primarily on the logo and the headline of the article. It’s important to consider that when the user lands on your website, they are on a mission. As the web designer, it’s important to make the content visually appealing and call out the important content such as keywords and titles, while also allowing the user the ability to scan the content. In the above example, the headline is eye-catching, so the user is drawn to it. This 1997 study by the Nielsen Norman Group (NN/g) found that users rarely read web pages, in fact, they found 79 percent of their tested users scan the page for the words or sentences they’re most interested in. More recently, this 2013 study that was done by Slate and Chartbeat got similar results. They found that in the standard 2000 pixel long webpage, the average user will only scroll through half of the page. While a whopping 38% don’t engage with the content at all. The next image is an example of a user that is looking to buy a ticket. You can see that based on the layout, the user can easily find the information they are looking for. Same goes for the following example. Users tend to focus on words and phrases that seem to match the reason why they are on the site or personal interests. Here’s an eye-tracking study from 2008 by the NN/g, where users were found to read less than 28% of the copy on a web page. Take a moment to read the examples below and think about how much information you actually read in each example. Example 1: Nebraska is filled with internationally recognized attractions that draw large crowds of people every year, without fail. In 1996, some of the most popular places were Fort Robinson State Park (355,000 visitors), Scotts Bluff National Monument (132,166), Arbor Lodge State Historical Park & Museum (100,000), Carhenge (86,598), Stuhr Museum of the Prairie Pioneer (60,002), and Buffalo Bill Ranch State Historical Park (28,446). Consider how much easier it was to read the second example and why. Clean formatting and bullet points allow users to easily scan the content. As a UI designer, the statistics are against you. The numbers say that a user is likely to not scroll all the way through your page, and is especially unlike to read all the copy on your page. This makes it extremely important to surface important information and links in a noticeable, clean way. Use section titles, bullet points, and clear links/buttons to make your site appealed to even the most inattentive of users.